This is an overview of my "Wilde" colony, a hive of bees named after Oscar Wilde. The queen bee of this colony is named Elizabeth. These honeybees are New World Carniolans, a breed active at lower temperatures and known for beginning to raise brood early in the year. 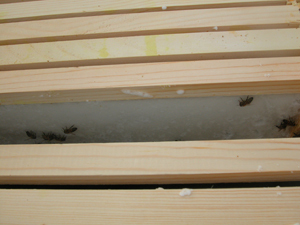 This page contains pictures taken during inspection of the top two parts of the colony: the feeder and a medium super containing fondant frames: these hive parts are circled in gold. 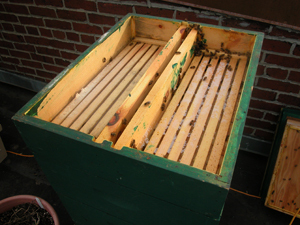 After popping the top off the colony, the first box you see is the hive top feeder I use to provide extra sugar syrup to the honeybees. Wilde's hive top feeder was empty: the bees have consumed a gallon of sugar syrup (two parts sugar to one part water) given 10 days ago. They had taken the same amount about 10 days before that. Throughout last summer, this colony had been reticent to take the sugar syrup they received, leading to real concerns about the population and health of the colony. They have been receiving January feedings because it has been an unusually warm winter and they have been quite active with no natural forage. They were also somewhat lighter on winter stores than my other colony. The bay at left received some "brood builder" pollen substitute on January 10, which the bees ignored. 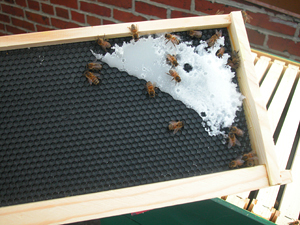 In December, MaryEllen and I made six one-sided frames of fondant, a frosting-like mixture made of sugar and a little vinegar, as an insurance policy against a shortage of real honey during cold weather. 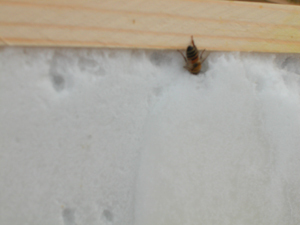 Bees do not readily eat sugar syrup during the lowest temperatures, and may starve to death as a result. They seem to take fondant, though. 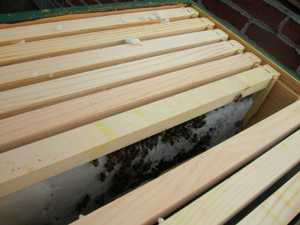 Ther frames of fondant were placed near my best guess of where the cluster of bees inside the hive was likely to encounter it as they naturally ate their way up through their honey stores: mostly toward the center of the box. 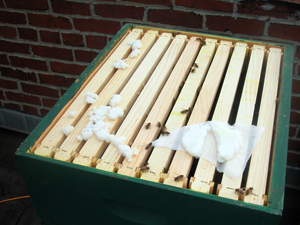 The sugary lumps sitting on top of the frames are the remains of grease patties that were given to the bees as a non-toxic agent against tracheal (and perhaps Varroa) mites. The Carniolan bees have clearly declined to have anything to do with them. This is what's left of the fondant frame furthest to the right, the western and sunniest side of the box. The bees have eaten all but this corner, and are finishing it up. The fondant was once smooth, but now has a texture like melted and re-frozen snow. I wondered if this meant that the bees had no stores left at all, that there might be an emergency condition, since they went for this sugar. They are supposed to prefer to eat their own honey if they have it. Moving frames aside to look at the rest of the fondant, I found the bees hard at work, and most of the candy still in place. 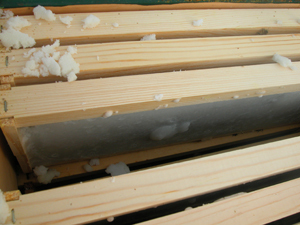 The very last frame of fondant in this box had one bee digging to China near the edge. I originally decided to pull the frame out because it looked like a bee had crawled into a hole and died, a source of concern ("Was this batch of sugar bad or contaminated? "), but as I pointed the camera, she backed out and started chewing the side of the hole. 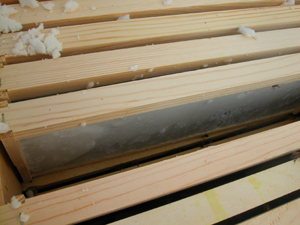 This is probably how the bees get started on each such frame. You can see other pilot holes, as well, but it's probably easier for the bee to get a steady handhold on the edge while she begins to burrow into the hard-ish candy. At this point I am thinking that there is still a decent amount of the candy left, so it is probably not a complete emergency winter feeding situation.